Even with the HTC One appearing today in its first press render, we still don’t have a firm date on its launch at Verizon stores other than “later this summer.” What we do have are a few signs that the DROID DNA is on its way out the door, which as you know, is the phone that most expect the One to replace. A couple of weeks ago we received a tip that authorized Verizon resellers had moved the DNA to “closeout” status, and that once stores ran out of inventory, that they wouldn’t receive new stock. The point – to clear out remaining inventory to make room for the One. 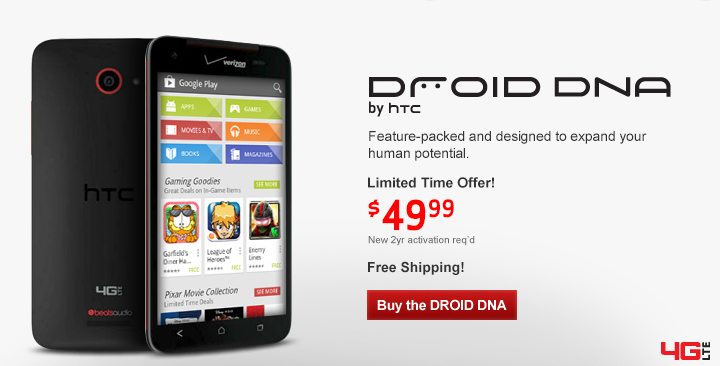 This morning, Verizon dropped the price of the DNA down to $49.99 on new 2-year contract. They are calling it a limited time offer, but if any of the previous signs mean anything, this could be Verizon’s move to clear out inventory from their online shop and in official stores. It could also just be a 4th of July sale. If you were interested in the DNA, now would be the best time to buy the phone that was one of the first in the industry with a 1080p display. It still packs some of the best specs in the business, even if it is seven or so months old. It really has been the last “DROID” deserving of the name. And if $50 is still too much, you can find it for a penny at Amazon.